- For Catholics Catholics fully participate in the celebration of the Eucharist when they receive Holy Communion in fulfillment of Christ's command to eat His Body and drink His Blood. In order to be properly disposed to receive Communion, communicants should not be conscious of grave sin, have fasted for an hour, and seek to live in charity and love with their neighbors. Persons conscious of grave sin must first be reconciled with God and the Church through the sacrament of Penance. A frequent reception of the sacrament of Penance is encouraged for all. - For Other Christians We welcome to the celebration of the Eucharist those Christians who are not fully united with us. It is a consequence of the sad divisions in christianity that we cannot extend to them a general invitation to receive Communion. Catholics believe that the Eucharist is an action of the celebrating community signifying a oneness in faith, life and worship of the community. Reception of the Eucharist by Christians not fully united with us would imply a oneness which does not yet exist, and for which we must all pray. - For Those Not Receiving Communion Those not receiving sacramental communion are encouraged to express in their hearts a prayerful desire for unity with the Lord Jesus and with one another. - We also welcome to any celebration those who do not share our faith in Jesus. While we cannot extend to them an invitation to receive Communion, we do invite them to be united with us in prayer. Ordinarily speaking, Catholics may receive Holy Communion any time they attend Mass, even if it is more than once a day. This is a change in Church law from previous practices. The Eucharist is one of the Sacraments of Inititation (along with baptism and confirmation). Often called 'communion,' the Eucharist is the very source of our entire lives as Catholics. 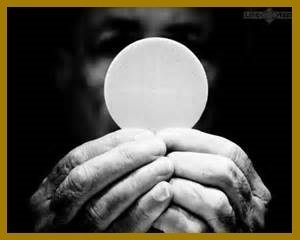 We say that because theEucharist really is the body, blood, soul, and divinity of Jesus Christ. This is not just a symbol. In the Sacrament, the very essence or substance of the bread and wine is completely changed. Because the Eucharist is Christ Himself, we say that the Eucharist is "the source and summit" of the Christian life. "By the consecration the transubstantiation of the bread and wine into the Body and Blood of Christ is brought about. Under the consecrated species of bread and wine Christ himself, living and glorious, is present in a true, real, and substantial manner: his Body and his Blood, with his soul and his divinity. " "I am the living bread that came down from heaven; whoever eats this bread will live forever;…Whoever eats my flesh and drinks my blood has eternal life and…remains in me and I in him." The liturgical celebrationis divided into two parts: the Liturgy of the Word and the Liturgy of the Eucharist. First we hear the Word of God proclaimed in the scriptures and respond by singing God’s own Word in the Psalm. Next that Word is broken open in the homily. We respond by professing our faith publicly. Our communal prayers are offered for all the living and the dead in the Creed. Along with the Presider, we offer in our own way, the gifts of bread and wine and are given a share in the Body and Blood of the Lord, broken and poured out for us. We receive the Eucharist, Christ’s real and true presence, and we renew our commitment to Jesus. Finally, we are sent forth to proclaim the Good News! This Catholic community gathers every week to celebrate the resurrection of the Lord Jesus. We do so through the Liturgy of the Eucharist at 5:00 pm on Saturday, and 8:30 am, and 10:15 am on Sunday. Mass is celebrated Monday through Friday at 8:00 am. This may change due to special celebrations. Please check the bulletin each week.